For Music Index No. 2, click here. Music Indexes are mostly for my benefit. They allow me to easily reach back into Earwigoagin's archive to listen to some of the music I've tucked away here. After all, this is a personal collection. This is Music Index No. 3. I add another Music Index every 50 or so songs. You can see the links for Music Index No. 1 and No. 2 at the top of the page. Music Whenever: Tuba Skinny "I Got the Blues"
To my mind, Tuba Skinny is the best New Orleans street jazz band to be found on the Tubes. Another New Orleans street jazz tune from the Earwigoagin archives. Why? Because I can. I would expect this design to be somewhat quicker offwind but slower upwind in a chop and light air. No plans to build this anytime soon as I have enough projects all ready. Here is the PDF file of the offsets. Click on the pop-out icon on the top right (hover your mouse pointer over the top right corner to find it) to get this into another tab where you can print or download the file. 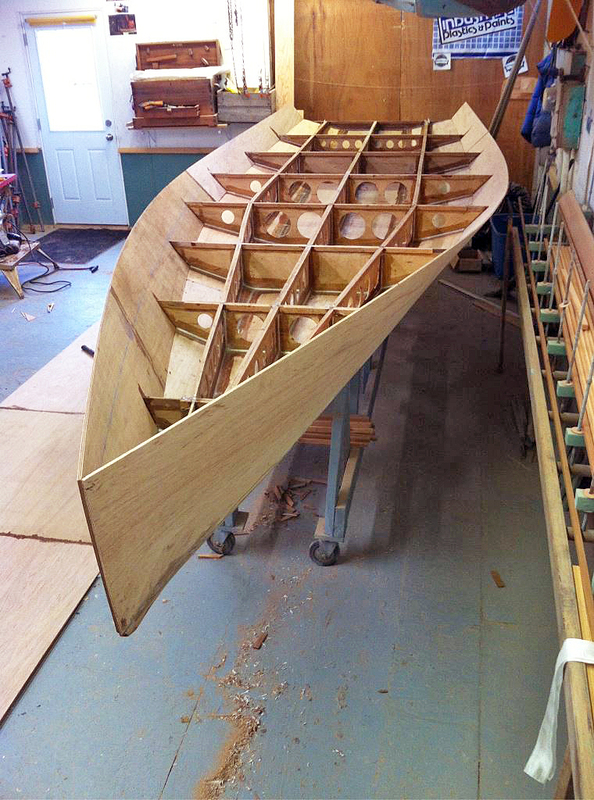 Another modified Fragnière (it looks like the transom bow doesn't match the plans). A 2001 build in France. I like the purple hull color. Erratum: This is actually the French Bilbon design which was patterned after the French Caravelle dinghy and not the Fragnière. Offsets for my other modified French Moth design, the Zippy can be found by clicking here. The classic Aussie 10 footer is the only other class (other than the Classic Moth) to be featured more than once on the header photo. This photo embodies a facet of the sport that is a combination of crazy balls-to-the-wall, close-to-the-edge racing whilst sailing on a beautiful all-wood classic dinghy. The lines to the Aussie 10 footer are also classic; a deep, roundish hull with enough flotation to accommodate three grown adults and a big rig in a ten foot dinghy. For reference the waterlines are set at 60 mm, and the buttocks at 125mm. Stations are spaced at 305. 610, 1219, 1829, 2438, 3048 mm. 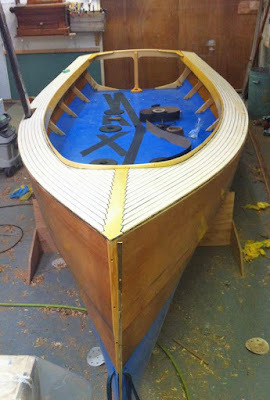 At the transom, the 1/2 width is 689 mm and the max width (not on a station) is 816 mm. 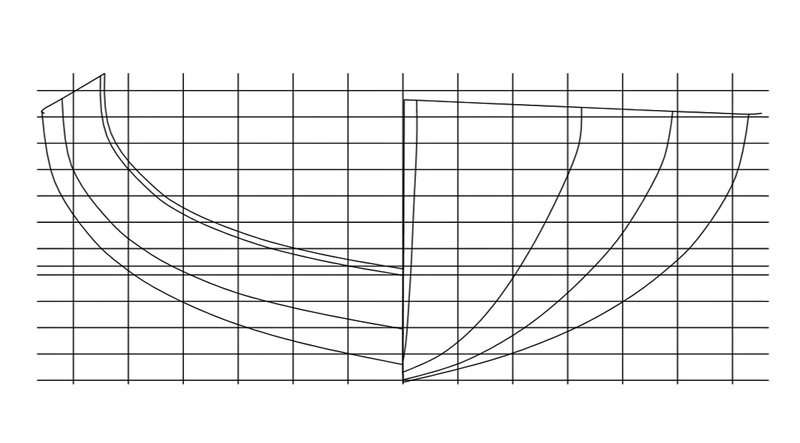 Here is the dxf file if one is so inclined to use it in drafting or modeling software. All dimensions in meters. Use to pop-out icon on the top right for downloading this file. Voiliers Classiques Moth, Dériveur Classique Moth. Further French Moth stuff here. Every once in a while I intersperse all my posts about planing boats, or racing, or boatbuilding with videos of people just enjoying a daysail and a day on the water. The wind is perfect, not too strong, not too light, the sun is out, the water temperatures are good for swimming. Sailing is best done with the feet up and a smile on the face. Zeilen op de Kagerplassen from Muxio on Vimeo. Jolle segeln is German for dinghy sailing. Here is a daysail in a true classic German dinghy, wood with traditional fittings. (Video settings doesn't allow me to embed.) I'm not sure what the class is, maybe a reader can help out. 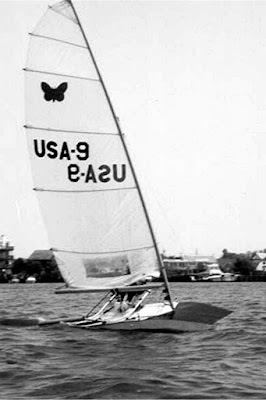 Here I am sailing my Quinlan design scow Moth at Brigantine YC, New Jersey. I named her Flatoo-a-T since she had no rocker at all. The design worked fine in flat water and some breeze; abysmal in a short chop. Another photo of USA-9 over over here. Kaagweek and Sneekweek are the two big sailing regatta weeks in The Netherlands. Kaagweek occurs first, somewhere around the middle of July. I came across this historically interesting video of Kaagweek filmed in 1940, seventy five years ago. Unfortunately the video settings restricts embedding on Earwigoagin, Click here to view the video. My first viewings of this video took in the pastoral beauty, the windmills, the myriad of, now traditional, Dutch classes heeling gracefully as they race their way up the small fingers formed by the dike systems, the spectators dining at the water's edge, the formal race committee attire, the pretty women walking the dock, ogled by young sailors. People are having fun, which is the whole point of a sailing week. The soundtrack of wistful swing tunes from that era adds to this period piece. It was then I realized that the 1940 Kaagweek took place two months after the Nazi's had overrun Holland. This Kaagweek was taking place in occupied Holland. Kaag looks to be about 15 km. from Rotterdam and during the invasion, the Nazi Luftwaffe had completely leveled the center of Rotterdam. The 1940 Kaagweek must have been held with the Nazi's approval. The question becomes whether this video was put together as Nazi propaganda to show that "normalcy" had returned to occupied Holland, or whether it was filmed surreptitiously as a home movie by a Dutch videographer. The production values suggests it may have been Nazi propaganda. Of note is at the 8:21 mark of the video, there is a stern-faced spectator wearing the Jewish star. "I doubt that this video was German propaganda. After the surrender of The Netherlands, it took some time for the German occupation to show its true Nazi colors. PS: Whereas de Kaag is definitely in Holland, Sneek is not! The country should be referred to as The Netherlands. Wavedancer (who was born there, just around that time)"
Wikipedia states that 205,000 civilians would die in the occupation of Holland with 1/2 of that number being Dutch Jews who died in the Holocaust. Many of those young sailors shown in the video would be forced to labor in German factories during the war. I'm not sure how many sailing regattas were still held in Western Europe during the summer of 1940 but by 1941, sailboat racing had ceased (with the exception of the Nantais Moth, which the Nazis and the French Vichy government allowed to be built during the war). July 10, 2015 also marks the 75th anniversary of beginning of the Battle of Britain, the approximate 2 month air battle where the Nazi Luftwaffe came within a sliver of destroying the British RAF. That the Nazi's didn't break the RAF would mark one of the turning points of World War II. Goering and the Luftwaffe would then turn in September of 1940 to bombing the British cities in an attempt to force capitulation. One of the mysteries of my life is how my loving mother, with her parents and siblings, endured the chaos, death, and destruction of the London blitz, and later the V-1 doodlebug, and V-2 rocket attacks. I never detected any true bitterness from her. She still maintains the attitude of always looking forward, never looking back - probably a residue of that British "stiff upper lip". The courage it took to maintain day-to-day living under such conditions still amazes me. The VX One - A Hybrid Whatsit? The VX One is one the new generation of hybrid racing designs, in this case a design that targets the longer (17' to 19' or 5 to 5.8 meters) dinghy market in the U.S.. 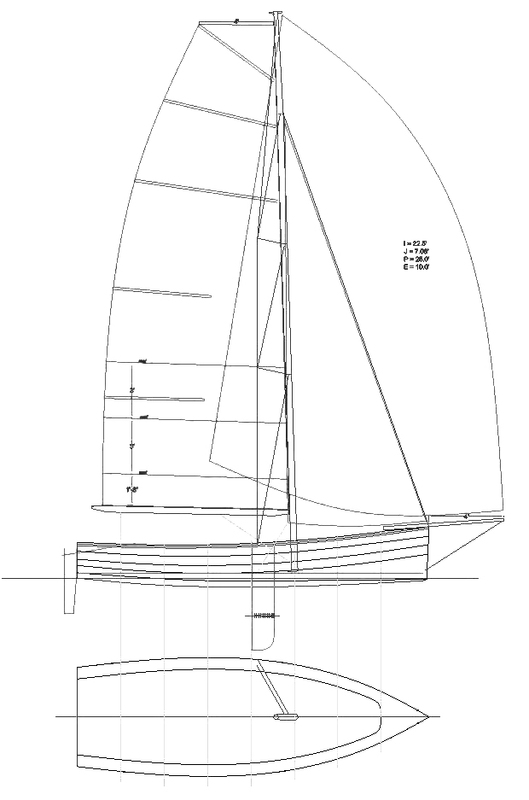 The VX One is that modern mashup of dinghy, skiff, and keeler concepts. It borrows most from the skiff world; the fat arse, narrow bow sections, flat rocker, assymetric and roachy full-battened sailplan. To calm it down a bit, it has a lifting keel of about 60 kg (135 lbs.). 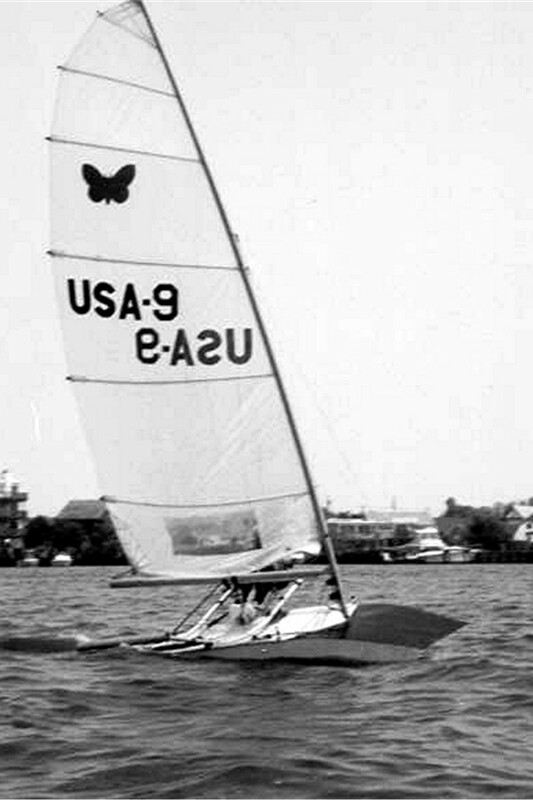 The VX One's length, sail area, overall weight and, no hiking assists, it is raced as a hiking sailboat, puts it out there as a modern market alternative to America's longer traditional hiking dinghy classes; the Lightning, Thistle, and Flying Scot. 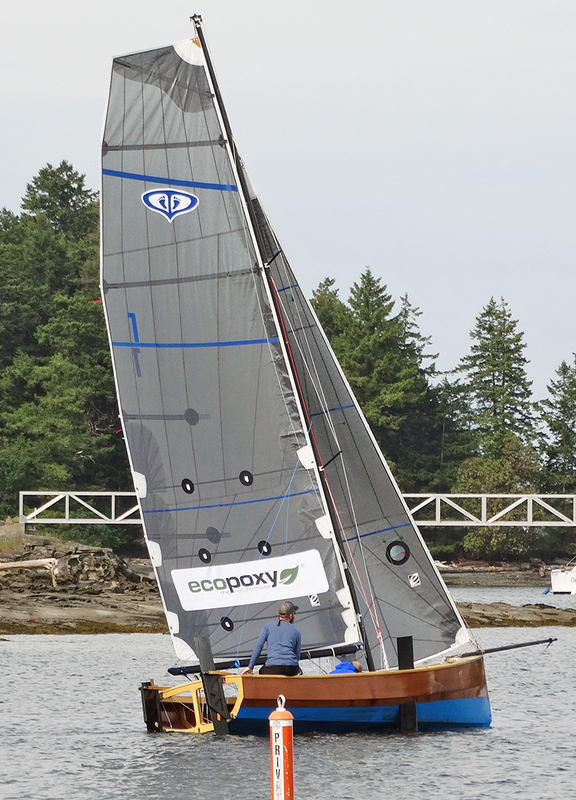 Conceived and designed by Brian Bennett, with naval architect data crunching by Rodger Martin (who also did the Johnson 18 in the early 1990's) and Ross Weene, the VX One seems to have maintained steady growth in the U.S. since 2011. 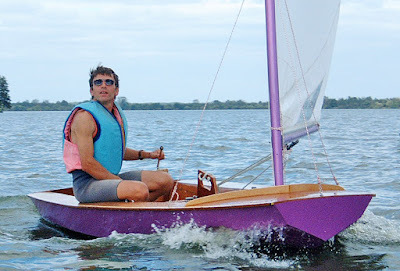 Though I couldn't find a price on the InterWebs, The VX One seems to be pricier than any of the aforementioned traditional large dinghies, and definitely more balls-to-the-wall than family oriented racing. Is this hybrid concept the way of the future in America small boat racing, where we seem to treasure both stability and performance? Here is a very nice video of the VX One with the obligatory planing-at-full-speed filling up most of the footage. Best of VX One Sailing from Ian Maccini on Vimeo. I chronicled the start of the Race To Alaska, R2AK, the 1207 km. (750 miles) slog from Port Townshend, Washington to Ketchikan, Alaska. The race is now finished with an attrition ratio of 25 DNF's vs. the 15 who were able to complete the course in the allotted one-month time-frame. Unusual for me, I monitored the tracker during the race, being particularly interested in how the large open dinghies (there were two of them, a Barefoot 5.8 built specifically for this race and a Mirror 16) would fare in this marathon. Not good as it would turn out. The Mirror 16 would drop out, and the Barefoot 5.8 would be the last to finish, 15th. With an inaugural race, over such an unusual course of such length, the initial possibilities of what constitutes a successful race program remain wide open. After the race, the picture is much clearer. Now with the results in, we can safely say; to win the R2AK with the current course, pick a very fast trimaran around the 8 - 9 meter (25 - 30-foot) range, and then crew it with three experienced offshore racers who know the drill, and can keep the accelerator down 24/7. That is what Team Elsie Piddock, in a F-25 carbon trimaran did, and they surprised themselves and everybody else by finishing in just over 5 days. Multihulls over 6 meters (20 feet) long took 5 of the first 6 positions. What type of experience wins the R2AK? Team Elsie Piddock goes over their sailing resume before the race. In the sailing monohulls, a disparate set of keelboats finished on top of that division. A Hobie 33 finished 3rd after holding 2nd for most of the race but lost out to a trimaran that made up about 160 km. or 100 miles in about a day and half of open water racing. A day racing keelboat, the Etchells 22, with a crew of three, finished tenth. It would be interesting to see how much the Etchells 22 sailed versus rowed as they seemed to spend much of their time making their way up to Alaska in the narrow cuts and not out in open water. The upwind ability of an Etchells 22 is extremely good but there are none, nada, creature comforts. 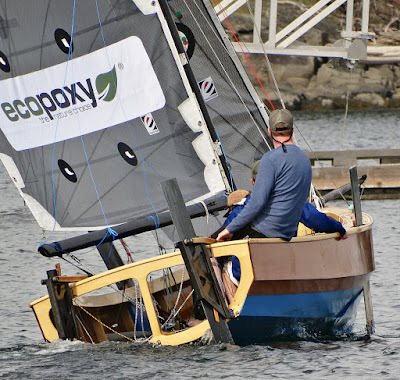 And in another demonstration of the turtle winning out over the hare (in this case the purpose built Barefoot 5.8), a pocket cruiser-keeler, the Montgomery 17 of Team Excellent Adventure finished 12th. When conditions were bad, they hunkered down, when they were good they kept going and when they had a chance to recharge, they took it (looks like they spent two days in Prince Rupert drying out, getting a shower, enjoying the restaurants.). All in all, a very creditable performance. Three crew on a 5.8 meter dinghy added too much weight in stores. The lack of stability of an open dinghy meant they couldn't safely keep the pedal down 24/7 so they pulled up at night. This negated the third crew, who was added so they could keep racing at night. 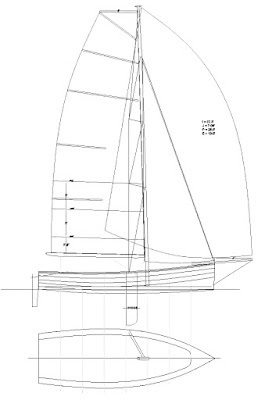 If the R2AK as an event keeps going, and you want finish it in a monohull sailboat under 6 meters (20 feet) the best path seems to be a keel type pocket cruiser with a crew of two. Of course, the type of sailor who already owns a pocket cruiser isn't one to think a 1207 km. race in colder and colder water would be any fun at all. A tip-of-the-hat to the design and sailing team of Team Barefoot Wooden Boats. They didn't finish where they thought they would, but they did finish. The Barefoot 5.8 was an innovative and bold design. It was wood and can be home-built. For shorter distance races this would be a very quick monohull. 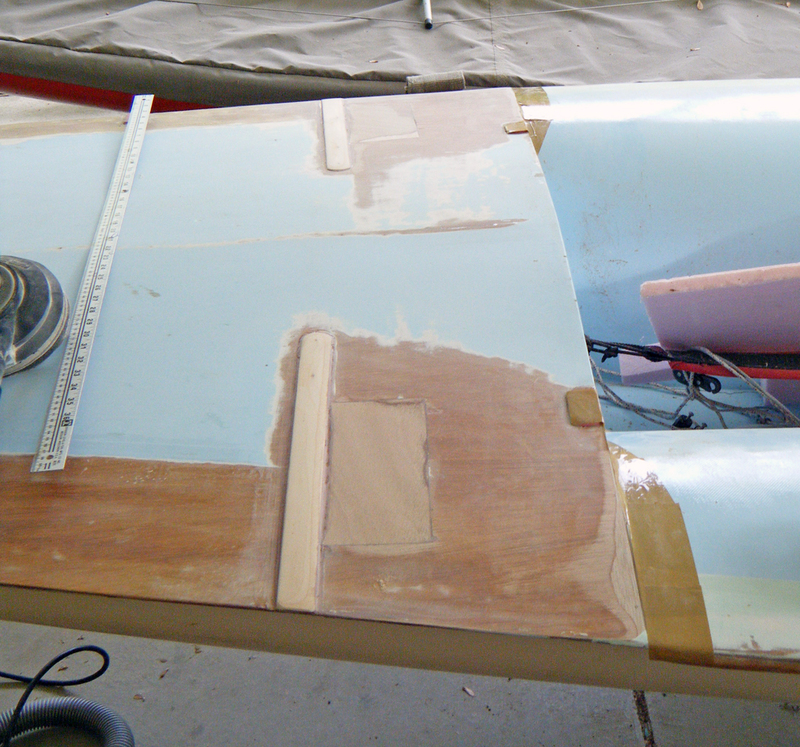 Designer Tad Roberts kindly sent along some photos of the build of the Barefoot 5.8 and some early pre-race debugging.. The Tad Roberts Barefoot 5.8 sail plan, Set on a tall mast, the sail area was quite big for this size dinghy. The initial plan was to reef early and often but I'm betting, if they had a choice, they would have changed to a shorter rig in the middle of this race. A very pretty sheer on this design. The Barefoot 5.8 was built around the very substantial double-bottom grid. The sides would be added on later. Wood was 6mm. plywood. Sides on. Deck on. You can see the kness that were used to support the top-side panels. Open transom and double rudders a'la the French offshore machines. The Barefoot 5.8 used hi-tech leeboards to keep the double bottom open for rowing and sleeping. The Barefoot 5.8 looks to be a very potent Everglades Challenge design. In that race, open dinghies of this size (I'm thinking of the Core Sound 17 and 20) can finish in just over two days. That seems about the right amount of time to drive an open dinghy 24/7 without completely boinking. Here is a short video of Team Coastal Express in their Mirror 16. They slogged their way through the toughest parts, the Seymour Narrows and the Johnstone Straits, before deciding they couldn't afford the time to finish the race out. This video looks cold, very cold. 11th place - Roger Mann - first solo competitor in a stock Hobie Adventure kayak/trimaran with Mirage Drive. Either you think this guy is Superman (he kept pushing 20 hours out of 24 for 13 days) or crazy-dumb (he almost lost his life twice, a pitchpole and another time he ended washed out but tethered to his kayak). 14th place - Mike Higgins in a 17 foot kayak. Yep, he paddled all the way. Reader Mike Scott, who lives on the left coast, and was much closer to the action, added this comment which I've dragged over to the main post. "I've been avidly following the race after being at the pre-race party, and getting up at 4am the next day to watch the start - which was set to the fanfare of the Russian National Anthem - quite bizarre, very stirring music, and typical Jake Beattie. I, too, loved the Barefoot Wooden Boat entry, and am hoping they might bring it up for the Wooden Boat Festival in September. Will be very interesting to see who and what enters next year - if it flies again. Much speculation on the 'perfect' boat, but as all depends on available wind and this year certainly favoured the speedsters, with a knarly Northwesterly blowing for much of the race......."
Alden Smith put a comment up about this photo and. in reply I realized I didn't know the history of the square meter rule. So a quick tour around the Internet turned up a couple of factoids. The rule originated in Sweden in 1907 as a reaction to the perceived rigidity of the International Meter rule. The current rule, administered by the Swedish Classification Board, traces back to 1925 with some tweaks along the way. 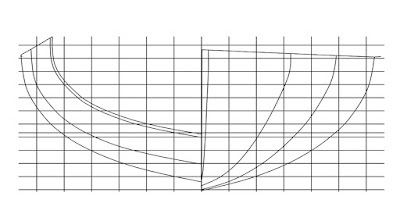 It is based on a sail area rule, the square meter is the sail measurement of the class though this is somewhat deceiving as only 85% of the jib foretriangle is measured, hence the extreme overlapping jibs to get free sail area. There were a bunch of classes from 15 sq. m. up to 150 sq. m. but the two that survive in some numbers today are the 22 sq. m. and the 30 sq. m.. If you want to dig in deeper, as usual, the best place to start is the Wikipedia page. There was a good number of 22 sq. m.'s that were either imported or were built in the United States and several years ago I came across one being restored in Annapolis. Unfortunately I've forgotten who the owner was. Sea State Marine, out of Missouri, of all places, (their blog is part of my blog list) is in the process of restoring a 1929 sq. m. Kippis, a Skerry Cruiser that was sitting in a barn in Missouri. Some, but not all, of Sea State Marine's blog posts on the 22 sq. m. rebuild can be found here. The Blue Peter from Nichole Raab on Vimeo. One difference as I have aged is I don't mind cutting holes in my boat. I wouldn't have even contemplated such an undertaking as a young'n. Last fall I was trying to figure out why I had paint cracking on the aft deck of my Maser. The aft deck seemed very soft. Three mm. plywood is flexible but this seemed worse than usual. The only way I was going to find out was to cut two holes in the aft deck. It turned out that there was a mini-frame, about 50 mm. deep, of 3 mm. 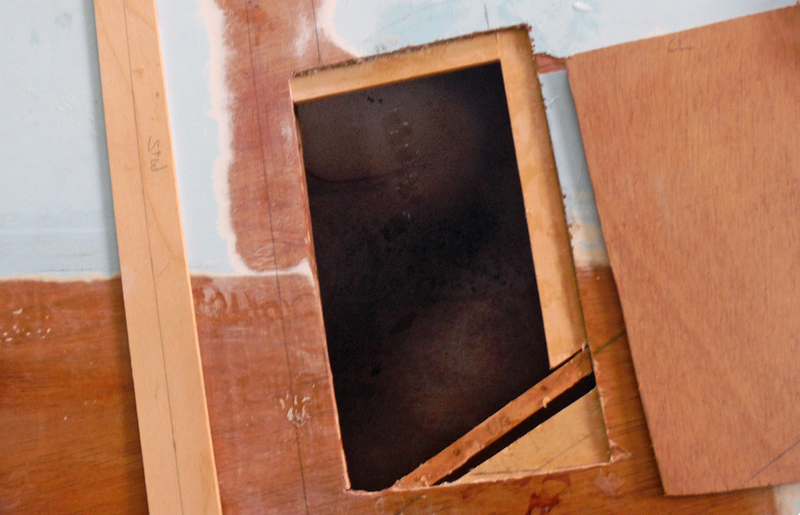 plywood, set aft about 300 mm. from the main aft bulkhead. It had cracked on both sides about 150 mm. in from gunwhales, probably when I had moved aft on that area on a heavy-air reach. To make the frame whole again, I sistered the frame at both the cracks. 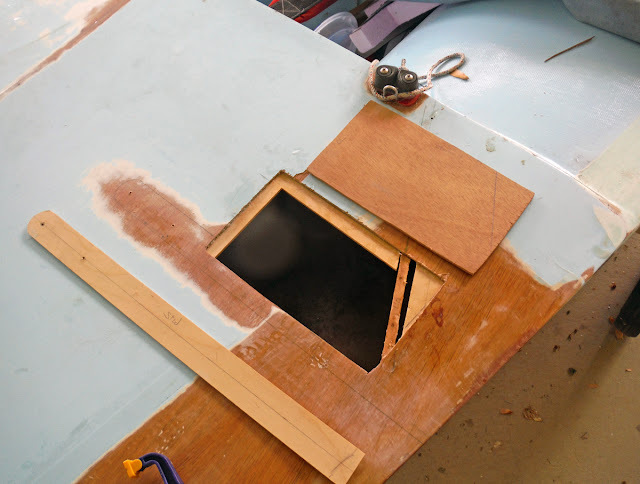 The following photos show the process of working backwards to get a watertight aft deck once the repairs had been made. Close up of the open hole with backers in place. Both plywood pieces in place, glued up. Top aft I-beam pine piece glued down. Repairs glassed over with 9 oz biaxial cloth. I was eventually able to get some primer down and that is how she looks at the present time. Good enough for a Tweezerman repair. Click here for the original Maser post.